The south facing stone wall is about 12' tall and is home to a cast of plants that have rooted into its crevices, enjoy the free draining soil, and flourish in the baking heat of the sun. The largest plant in the wall by far is the plume poppy, Macleaya cordata native to China and Japan. This member of the poppy family blooms in summer and will soon put out a spray of white flowers. Heliotropism works to our advantage here, causing the handsome foliage to be displayed to us in the best way possible. 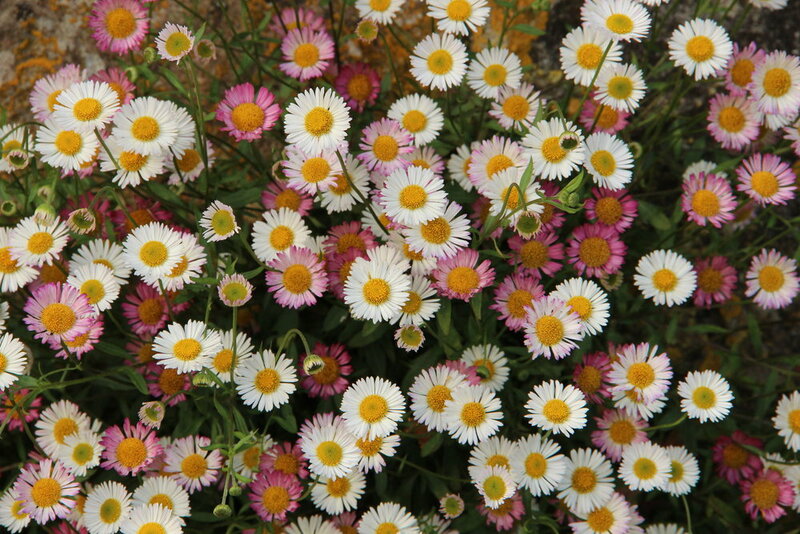 A small plant by no means, Erigeron karvinskianus, is a South American native, and is a member of the Asteraceae family. The tiny perennial plant with daisy-like flowers thrives happily in full sun and well drained soil and loves to self seed. These self sowers are pest and disease free and can quickly create dense carpets of blooms, giving a textural buzz. I have also seen these cheerful blooms colonize steps at Great Dixter, causing smiles to anyone walking over them. The diminutive blooms with golden yellow discs florets first emerge white, turning to a pinkish-purple as they age. A Geranium planted in the bed beneath, stretches up to reach the Mexican fleabane to create a colorful combination that couldn't exist any other way. A vertical pairing like this one in the photograph is successful in terms of contrast between the Erigeron and Geranium blooms and handsome Macleaya foliage. This combination could still work if planted in the ground next to each other but it will be drastically different. A native perennial to England, Euphorbia amygdaloides, the wood spurge, is usually found growing in woods and clearings but has taken root in the wall, showing us the power of geotropism. On another part of the wall we have a rock climber growing from the crevices. These purple blooms belong to Campanula porscharskyana with heart shaped foliage and is known as the Serbian bellflower.